Dylan Martorell is a Melbourne-based artist and musician. Transience, improvisation and collaboration form the basis of Dylan’s practice. Housed within the conceptual framework of a musical diaspora, his work is drawn to ways in which music travels through space and is affected by changes in geography, climate, culture and materials to become an agent for cross-cultural reciprocation. 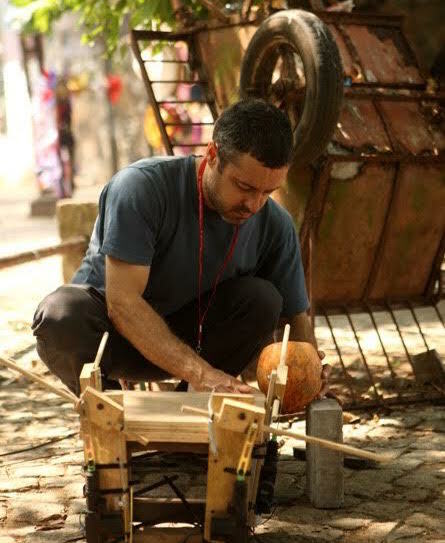 Focusing on the use of site-specific, gleaned materials and incorporating elements of upcycling, DIY culture, robotics, and alternative power sources, Dylan’s recent projects in Thailand, India, Indonesia, Singapore and Australia have focused on concepts of transience, portability and sustainability.